Karna attaches an arrow to his bow, pulls back and releases – the arrow is aimed at Arjun’s heart. 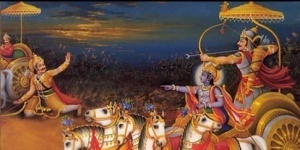 Krishna, Arjun’s Charioteer, drives by sheer force the chariot into the ground several feet. The arrow hits Arjun’s headgear and knocks it off. Missing its target – Arjuna’s heart. Comparison between Krishna and Karna on various occasions. Some of them are Myths while some are pure facts. 4. Krishna was asked by his people – Yadavas- to become, King. Krishna refused and Ugrasena was King of the Yadavas. 5. Krishna broke his vow of not picking up a weapon during the War, when he impulsively rushed at Bhishma Dev with his Chakra. – Krishna was cursed to his Death by Gandhari as she felt he allowed the War to unfold and could have done more to prevent it. 10. Prior to the War, Krishna was looked upon with great respect and reverence. Even among the Yadavas, they knew Krishna was great, nay The Greatest…yet, they didn’t know his Divinity. Very few knew for sure who Krishna was. After the War, many Rishis and people were angry with Krishna as they felt he could have prevented the atrocity and millions of deaths. 11. Krishna/Karna had an enormous amount of respect for each other. Karna somehow knew about Krishna’s divinity and surrendered himself to his Lila. 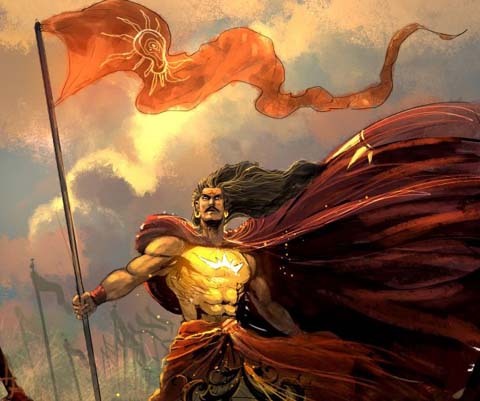 Whereas, Karna surrendered to Krishna & gained glory – Ashwattama could not accept the manner in which his father, Dronacharya was slayed and unleashed a vicious guerrilla warfare against the Panchalas – men, women & children. Ending up being a bigger villain than Duryodhana. 13. KARNA is the creation of Krishna to show the world the true meaning of sacrifice and to accept your fate. And in spite of all the bad luck or bad times you come across maintain: Your Spirituality, Your Generosity, Your Nobility, Your Dignity and Your Self- Respect and Respect for others. KARNA is the creation of Krishna to show the world the true meaning of sacrifice and to accept your fate. And in spite of all the bad luck or bad times you come across maintain: Your Spirituality, Your Generosity, Your Nobility, Your Dignity and Your Self- Respect and Respect for others.